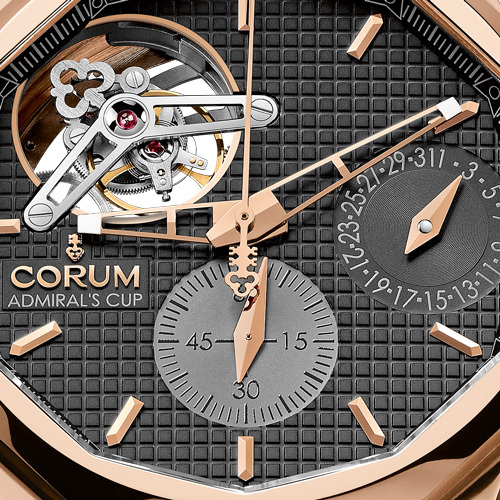 A contemporary interpretation of classic complications, the new Admiral’s Cup Seafender 47 Tourbillon Chronograph by Corum appears in a formidably technical interpretation designed for daily wear, whether in a sporting or an urban environment. This rare degree of sturdiness that is indeed almost unheard of on a tourbillon model, makes the Admiral’s Cup Seafender 47 Tourbillon Chronograph particularly adaptable to daily living, since the watch can be freely worn in both urban and sporting contexts. The CO 398 caliber beating at the heart of the Admiral’s Cup Seafender 47 Tourbillon Chronograph harbors still other feats. Its entirely integrated chronograph is controlled by a column-wheel governing its functions. Far more complex than modern cam-type mechanisms, this noble architecture is in keeping with the grand horological tradition and ensures a particularly gentle mode of activation. The excellence of the CO 398 movement permeates every detail, since each component is hand-polished and chamfered – ameticulous hand-crafted approach that entailed technological constraints upstream in terms of machining. Since polishing involves removing tiny micro-millimetric quantities of matter, the rough parts were made slighter larger than their functional size. While the process is undoubtedly complex, it avoids the risk of removing too much matter and ending up with an overly diminished size might be detrimental to the perfect interaction of the finished parts – and thus to the smooth running and precision of the movement. The caliber may be admired through the sapphire caseback in all its finely hand-decorated splendor, featuring delicate straight graining, as well as circular graining on the mainplate, bridges and wheels. 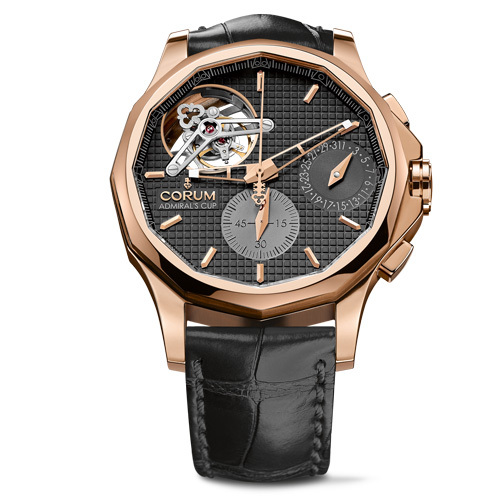 Pushing this aesthetic finesse to its absolute limits, Corum has even openworked the ruthenium-coated oscillating weight so as to better reveal the stunning sophistication of this first-rate movement. Clearly designed for daily wear, the Admiral’s Cup Seafender 47 Tourbillon Chronograph displays an aura of sporting elegance accentuated by the iconic nautical pennants on the inner bezel ring and the twelve-sided shape of the case. Stylishly flaunting its generous 47 mm diameter, it is fashioned from aluminum with an anthracite grey ceramized coating. 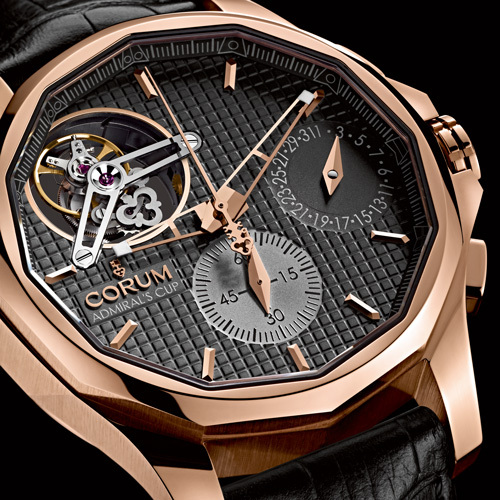 Its exploration of materials science led Corum to adopt the MAO (micro-arc oxidation) technique invented in Germany in the 1960s, but not industrialized until 2006 thanks to computerization and technological advances in the domain of equipment. 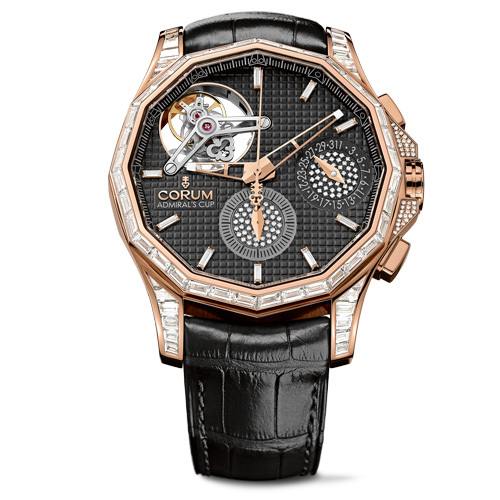 The particularly innovative treatment used by Corum is accomplished by an electrical, physical and chemical transformation of aluminum immersed in a water bath. This patented ecological method makes the watchcase truly exclusive and features a number of advantages. The ceramization technique gives aluminum a ten-times longer lifespan by making it harder than steel. It is also anti-abrasive and protects against corrosion, while lending an extremely beautiful aesthetic touch and an extremely pleasant feel. Also available in an 5N 18kt red gold version, the case of the Admiral’s Cup Seafender 47 Tourbillon Chronographis interpreted in three gem-set jewelry variations. 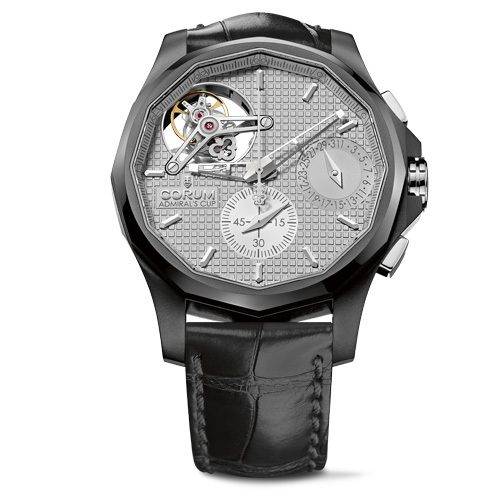 While all features a 60-minute counter and small seconds subdial paved with 88 round diamonds (approx. 0.13 carats) and 9 baguette-cut diamonds (approx. 0.04 carats) as index, the differences between the models relate to the case. On the first, the bezel, lugs and pushpiece guards are adorned with 204 round diamonds (approx. 2.13 carats); while the second adopts the same 144 round diamonds (approx. 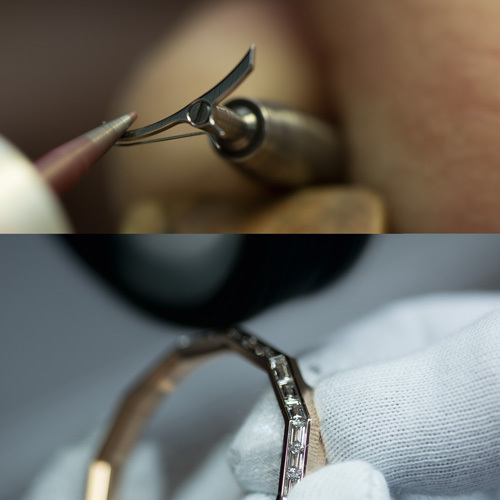 0.63 carats) embellishing its lugs and pushpiece guards, while opting to light up the bezel with 36 baguette-cut stones (approx. 4.71 carats). The baguette cut is featured yet more strongly on the third jewelry version with its 60 baguette-cut diamonds (approx. 6.01 carats) set on the bezel and lugs, while the pushpiece guards sparkle with 36 round diamonds (approx. 0.05 carats). The Admiral’s Cup Seafender 47 Tourbillon Chronograph comes with two straps: the first in black crocodile leather, and the second in a rubber-look leather for the non-gemset models, and in brown crocodile leather for the jewelry creations.